Those of you who have visited us before will know that we are in a prime location in Clifton Village, set apart from the bustling city below. 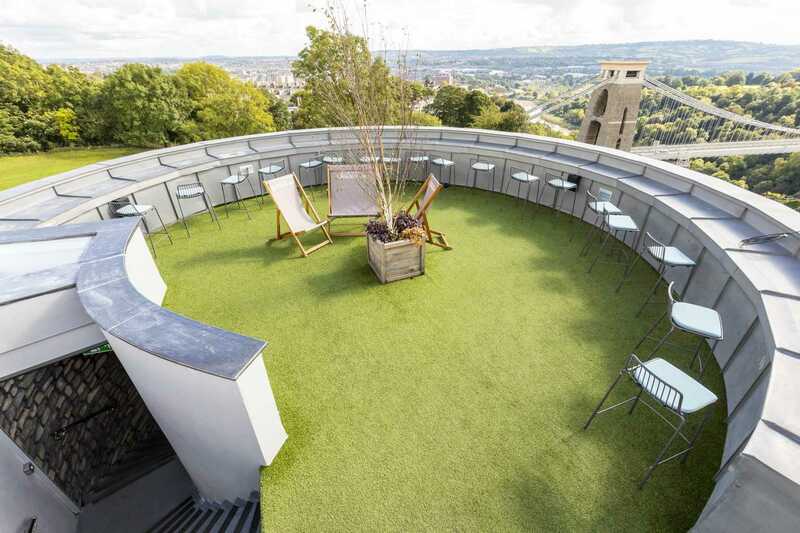 Towering above the iconic Clifton Suspension Bridge and Avon Gorge, our 360 Rooftop Terrace boasts an unparalleled 360° vista of Bristol. We have two licensed bars, one of which is outdoors on the roof terrace, so up to 100 of you can enjoy the calm of the idyllic Downs with a drink in hand! The William West Room, named in honour of the Bristolian artist and creator of our 19th century Camera Obscura, is a grand indoor space with a sparkling chandelier, stage area, and DJ booth with PA and AV systems, accessed through its own separate entrance. Here, we can host 100 standing guests, or 60 for a seated banquet. The William West Room is home to our second stocked bar, and leads discreetly to our fully equipped kitchen, from which our contractors can provide catering. You and your guests are welcome to visit the Clifton Observatory attractions in groups. 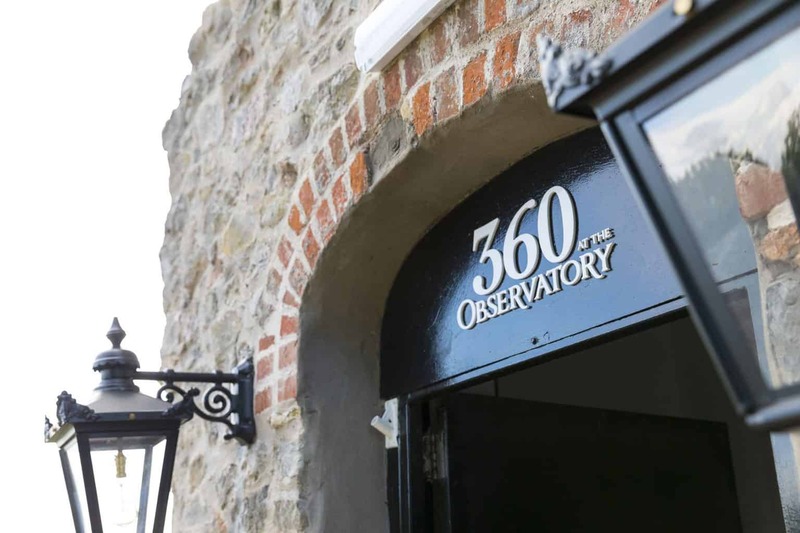 The Observatory Tower leads guests up on a historical journey to the original Camera Obscura above, and the viewing balcony of the Giant’s Cave is accessed through a long, steep tunnel that takes you 90 feet underground. Not only are these both great vantage points for dramatic photo opportunities, your wedding service can actually be performed in these unique spaces too! 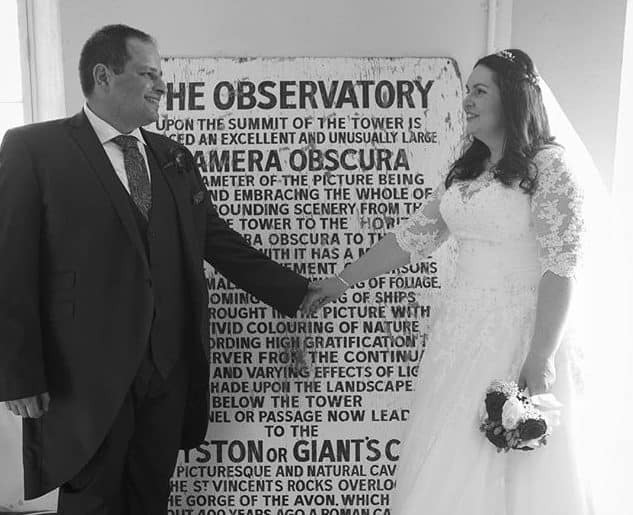 For an intimate ceremony of roughly 10 seated guests, you can get married in our Photography Room – a private circular room, halfway up the Observatory Tower. For a more eccentric experience, you can invite 20 standing guests to watch you wed in the Giant’s Cave whose balcony offers a stunning backdrop across the gorge. For a larger ceremony of up to 70 seated guests, the William West Room with its high ceilings will provide all the room you need. We are licensed to host your wedding service, breakfast, and reception, or any combination of the three, and are proud of the unique spaces we can offer. Get in touch using the contact form below, or send us an email at enquiries@cliftonobservatory.com, to start organising your special day with us today!